Professor Jordan, evil mastermind behind The 39 Steps, enjoys a family life any of us would envy. "In the old days villains had moustaches and kicked the dog. Audiences are smarter today. They don't want their villain to be thrown at them with green limelight on his face. They want an ordinary human being with failings. "There really resides in the heart of each of us a wild beast which only waits the opportunity to rage and rave and injure others, and which, if they do not prevent it, would like to destroy them." In an Alfred Hitchcock film, evil isn't content to lurk just in the hearts of men. It resides in a flock of birds, in a glass of milk, behind a shower curtain and even out on the dusty breadbasket of the Midwest. Unless we are especially diligent, that evil can erupt into chaos at any time. The problem with Hitchcock's villains is that they simply fail to perform their due diligence. When his baddies spring into action, the catalyst for their crime isn't necessarily greed, or lust. All too often, their vice is boredom. Sloth. Whether they happen to live in a Gothic mansion (Psycho), a Manhattan penthouse (Rope), or a Long Island estate (North by Northwest), Hitchcock's bad guys often have an abundance of two things: money and time. Thus, when Shadow of a Doubt's (1943) Uncle Charlie (Joseph Cotten) sprawls on his bed languorously swirling a cigar between his lips, you can be sure that ugly business is afoot. Uncle Charlie, a.k.a. the Merry Widow Murderer, ingratiates himself into the lives of wealthy widows, marries them, and then kills them once he's sure he's in their will and a probate judge won't blink at the timing of events. Although you can't rule out greed, it seems that something else motivates Uncle Charlie to do what he does. His victims live idle, vain lives, in which their wealth is a waste. He calls these widows "silly wives, useless women, smelling of money. Faded, fat, greedy women" who sit in expensive hotels drinking and playing gin rummy. To Charlie, they are a liability to mankind, best eliminated. He's not so much a murderer as a missionary. And that's where Hitchcock's villains become so confounding. At the movie's outset, Uncle Charlie's housekeeper suggests that he is too trusting, that "not everybody in this world is honest, you know." After that, almost every character, including the police, the children, his niece, young Charlie, and other supposedly upstanding folk lie, cheat, or otherwise maintain false pretenses in one way or another. There's villainy afoot wherever one's glance happens to fall, if only one would take a moment to look at it. It's no wonder that, in her soul-sickness, young Charlie laments: "I don't believe in good intentions any more." As Thomas Leitch, author of "The Hitchcock Encyclopedia," observed, "there is a more precise formula for assessing the importance of villains in Hitchcock's films … that depends on the slipperiness of the term villain in Hitchcock compared to the [more accurate] term villainy." And a Hitchcock movie is shot through with villainy from all sides. 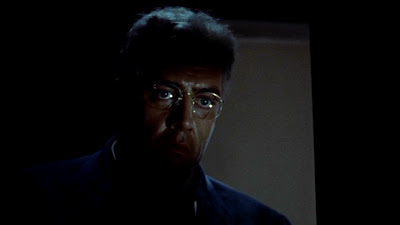 Wife killer Lars Thorwald (Raymond Burr) got just one close-up scene in Rear Window (1954), but L. B. Jeffries (James Stewart) was no less guilty for hoping that his neighbor dismembered his wife. And Lisa Fremont (Grace Kelly) gleefully joined him in this morbid fantasy. Further, audiences pay good money to be entertained by onscreen violence. Speaking with their wallets, it's as if they are willing violence into the movie. "So a better formula might be to substitute villainy for villains: the more villainous Hitchcock can make his heroes act, the more completely he can blur the line between heroism and villainy." Uncle Charlie has what one could call a metaphysical connection to his young niece. As a token of this, he gives her a ring that he had taken from one of his victims. Wedding, school and fraternity rings are emblems of communion, solidarity and brotherhood. In this case it has almost incestuous implications. 4, 5 Inasmuch as both Charlies represent qualities universal to human nature, Charlie's ring signifies that we all are members of that international fraternity of evil-doers known as Mankind. We have all perpetrated our share of villainy. Thus, in Hitchcock's world, the "hero's" hoped-for moral high ground doesn't have much of a view after all. In fact, it's the villains who often serve as the film's conscience. "What do you want from me?" asks Lars Thorwald, reminding Jefferies that his invasive voyeuring is just as illegal as murder. Uncle Charlie chides his niece, saying, "You go through your ordinary little day and at night you sleep your ordinary untroubled little sleep filled with peaceful, stupid dreams." Sometimes villainy springs from a willful kind of ignorance. Thus, Uncle Charlie added, "You live in a dream. You're a sleepwalker. Blind. How do you know what the world is like? Do you know the world is a foul sty? Do you know that if you ripped the roofs off of houses you'd find swine? The world is a hell." It may be pessimistic, but, if we're honest, we'll recognize that it's true. It says a lot about me and probably you, too. So evil is everywhere, and we must be especially vigilant to keep it from gaining more ground than it ought to occupy. As one of the detectives says at the end of the film, "sometimes [the world] needs a lot of watching. It seems to go crazy every now and then." I've seen the villain in Hitchcock's movies – and the villain is us. 2Santa Rosa in 1943 was the epitome of the American small town – a real life Grover’s Corners (of "Our Town" fame) where nothing really bad ever happened. 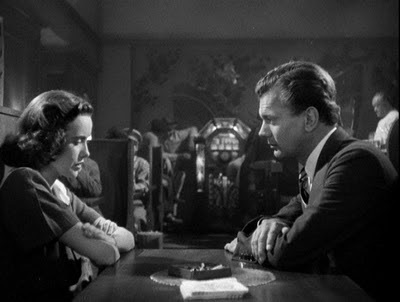 Hitchcock hired "Our Town" author Thornton Wilder to write the screenplay in order to capture the essence of small town American life – and the darkness that dwells therein. 3Interestingly, following the Columbine school massacre, Michael Moore interviewed Marilyn Manson, who had been accused of sharing responsibility for the tragedy because the two killers were fans of the artist and his violent music. Manson passed blame to the Clinton Administration, noting that the date of the massacre coincided with the heaviest day of U.S. bombing of Kosovo in the history of the war. Hitchcock would likely have countered that all parties mentioned above share a measure of blame. 4The scene in which he presents the gift, sliding the ring on to her finger like a wedding band, is framed to look like a wedding ceremony. 5The circularity of the ring also suggests the claustrophobia of a closed loop. It binds one, as in marriage. 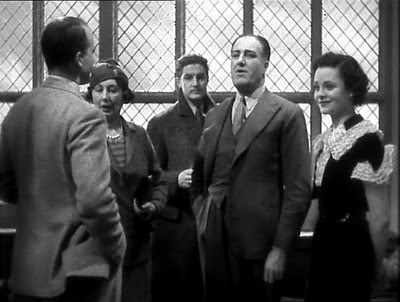 These meanings surely occurred to Hitchcock, who years earlier had expanded on those themes in his silent-era The Ring (1927). 6Screen Writer John Michael Hayes, who collaborated with Hitchcock on several of his films, commented on the ordinariness of the villain in Rear Window. He said: "Grand flourish in a villain works for Bond movies, I suppose, but, in the world you and I live in, true villains don't act as such.… There's a form of everyday villainy that is largely forgotten now in cinema. And that's what audiences can align best with – what it is they see and know in everyday life." 7At the end of the film the two Charlies struggle aboard a speeding train. Uncle Charlie falls to his death and it is unclear whether he tripped or was pushed by his niece. And so it goes for many Hitchcock villains. They often die ambiguously at the hero’s hands, under circumstances under which it is unclear whether or not the hero intended to kill them. See Sabotage and Saboteur, for starters.